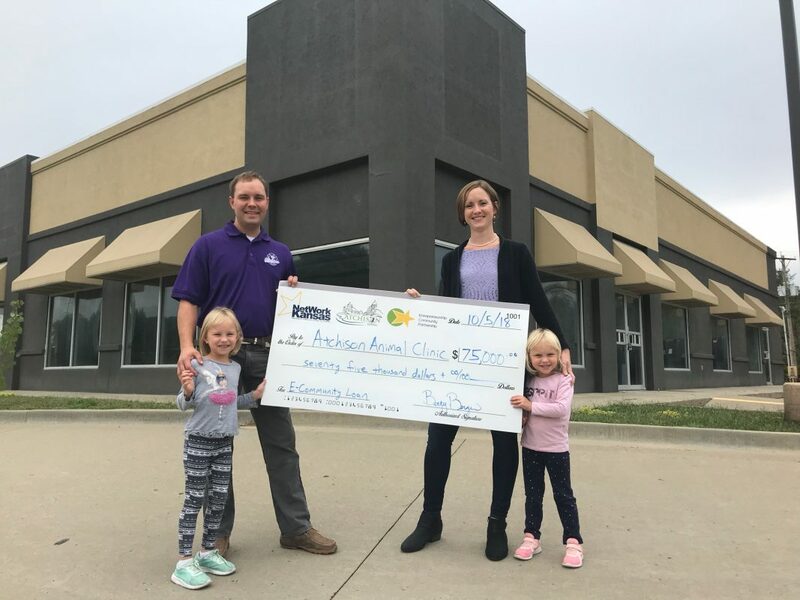 Atchison, KS – The City of Atchison’s E-Community Program is pleased to announce a new loan to Atchison Animal Clinic. The loan funds will flow through Timber Road Real Estate, LLC, a holding company that will exclusively lease the property to Atchison Animal Clinic. The expansion project, which will transform the former KFC/Taco Bell property at 1401 US Hwy 59 into a state of the art veterinarian clinic, is expected to result in up to eight additional full time employees over the next several years. The $75,000 in loan proceeds will help finance a comprehensive renovation and expansion of the facility. Timber Road Real Estate, LLC is owned and operated by Chris and Emily Hansen, both of whom pictured in the image above with two of their three children. Additional financing for the project was provided by UMB Bank. Since January of 2017, the Atchison E-Community Program has been offering loans for small business startups, expansions, and acquisitions. Everyday businesses like coffee shops, guitar stores, construction companies, doctor’s offices, art galleries, etc… can use this locally controlled, revolving loan fund as gap financing to make their small business dreams come true.